Universal Studios Home Entertainment has picked July 9 as the DVD and Blu-ray/DVD Combo Pack (with UltraViolet) street date for writer/director Andrew Niccol’s film adaptation of Stephenie Meyer’s sci-fi novel, The Host. The ARR is 109 days and ticket sales at the local multiplex came in at $26.1 million. Humans play host to viruses of all sorts, but when an alien race acts pretty much as a virus and starts to take over all of humanity … it is time to fight back, but there are so few left to do so. 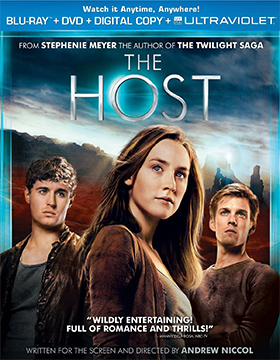 Bonus features include commentary from author Stephenie Meyer and filmmaker Andrew Niccol, deleted scenes and a featurette. 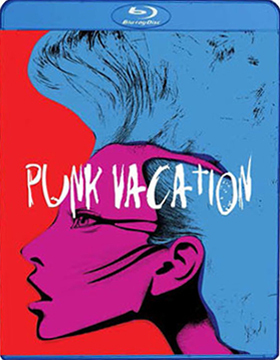 News arrived this past week that Vinegar Syndrome is bringing director Stanley Lewis’ cult-status film, Punk Vacation, to the home entertainment market on July 9 as a Blu-ray/DVD Combo Pack. Murder in a remote hamlet leads to an all-out war between the inbred locals and, we kid you not, vicious punk rockers. A classic! Bonus features include video interviews with actor/producer Stephen Fusci and the film’s production coordinator Steve Roland, a stills gallery and as a bonus feature, writer/director Frank Roach’s 1984 biker revenge flick, Nomad Riders. Director Laslo Benedek is best remembered for his early 1950s films, Death of a Salesman and The Wild One, he then migrated into TV series work (quite a few Perry Mason episodes, plus a trio of Outer Limits … and more) and you might think as he aged that he would just drop out of sight. But he had one more little gem left in him. That would be the 1971 theatrical release of The Night Visitor, which teamed two Ingmar Bergman regulars, Max von Sydow and Liv Ullmann in this English-language psychological chiller. VCI Entertainment has a remastered DVD edition ready for genre-fans to enjoy on July 2. There are some things that best remain in space. 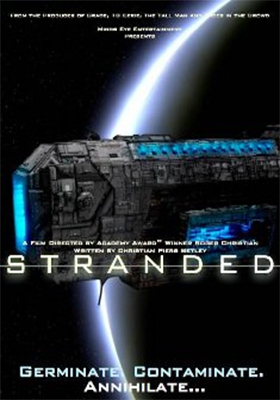 That’s what it comes down to in Image Entertainment’s Aug. 27 DVD and Blu-ray debut of director Roger Christian’s sci-fi chiller, Stranded. A seemingly routine mission aboard a space station orbiting the moon takes on life-and-death urgency, not just for the crew, but for all mankind when debris from a passing meteor shower smacks into their home away from home leaving behind deadly spores. Colonel Brauchman (Christian Slater) is in charge and must deal with the horror of an infection that is like none anyone has ever seen. When crew member Ava Cameron (Amy Matysio) is exposed to the spores she quickly cycles through a pregnancy (less than two days) and gives birth to a creature that can mimic anything it comes in contact with. Very much in the spirit of John Carpenter’s remake of The Thing, only this time in space, paranoia reigns unchecked in the small confines of the station as no one can be trusted. All Brauchman knows is that if an infected host ever reaches earth an unimaginable plague could wipe out human life … as we know it! HBO Home Entertainment has one of the best action/drama series on cable with the Steve Buscemi Roaring ‘20s crime saga, Boardwalk Empire. 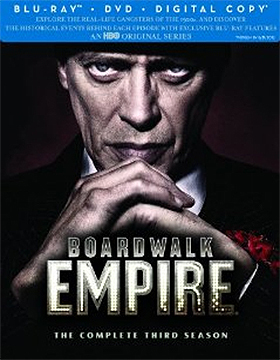 On Aug. 20 look for DVD and Blu-ray/DVD Combo Pack SKUs (with UltraVioltet) of Boardwalk Empire: The Complete Third Season. The wrap-up to last season was a double-stunner as Nucky Thompson (Buscemi) dealt with a “problem” in a most unexpected way and yet, as smart and clever as he is, he found himself on the short end of the proverbial stick as Margaret (Kelly Macdonald) does the unthinkable. As bad at it seemed then, it could get a whole lot worse as Gyp Rosetti (Bobby Cannavale) enters the picture and sees a soft spot in the Thompson operation. Where does the time go? 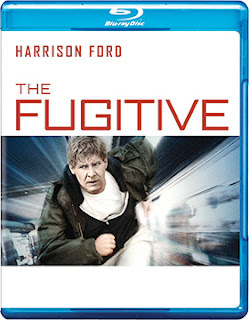 It seems like only yesterday that Harrison Ford was on the run as Dr. Richard Kimble and Tommy Lee Jones was his relentless pursuer in director Andrew Davis’ film version of the long-running television series, The Fugitive. On Sept. 3, Warner Home Video will be release a 20th Anniversary Edition of this clever cat-and-mouse action film on Blu-ray. Bonus goodies include an introduction by Harrison Ford and director Andrew Davis, a commentary option teaming Davis with Tommy Lee Jones, two vintage featurettes — “On the Run with the Fugitive” and “Derailed: Anatomy of a Train Wreck” — a newly-prepared featurette titled “The Fugitive: Thrill of the Chase,” and the television pilot for 2000 re-launch of the series (featuring Tim Daly as Kimble). Also on the release calendar from Warner Home Video is a second four-film DVD collection of newly remastered Charlie Chan mysteries. 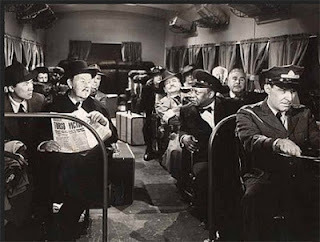 The street is Aug. 6 for Shadows over Chinatown (1946, with Sidney Toler as Charlie Chan), Docks of New Orleans, Shanghai Chest and The Golden Eye … all released theatrically in 1948 and starring Roland Winters as the legendary Honolulu detective. And, speaking of mysteries, the latest Scooby-Doo/Shaggy feature-length animated adventure mystery, Scooby-Doo! Stage Fright, will be arriving on DVD and Blu-ray/DVD Combo Packs (with UltraViolet) on Aug. 20. When it comes to the home entertainment launch of director Sam Rami’s Oz the Great and Powerful it appears to be a case of fire, ready, aim! Walt Disney Studios Home Entertainment has somewhat haphazardly, it would seem, set a June 11 street date for a four-SKU release of this theatrical smash. What makes this a curious move is threefold. First, the announcement comes after the pre-book date of Apr. 30, which leaves no solicitation period. That is becoming a common occurrence with these mega-theatrical hits these days. The reasons for the seemingly backwards way of launching a major property into the home entertainment market place are not exactly clear (and we won’t even go there with this one). So that’s the first curious move on the part of the studio. An announce date after pre-book. No big deal, if you have the gold — and in this case we are talking about a film that has pulled in $228.9 million in domestic ticket sales — you can set any date you please. Which leads us to the second curious element in this mix. Why June 11? A street date on the cusp of summer, with consumers focused on the big summer theatrical hits seems a bit odd for a film of this magnitude. Frankly, we pegged this for an early September window with sales being generated all the way through Christmas. OK, odd, but when you have the gold you can (drum roll, please) pick any damn date you want! June 11. Perfect. No argument. The ARR, by the way, is a zippy 95 days. The third curious element in this rush-rush-rush to market push for Oz the Great and Powerful comes in the form of the SKU configuration. The 3D and 2D versions are being packaged separately. No big deal, but Disney has been putting out 3D/2D Blu-ray Combo Packs on a regular basis, but their new wrinkle here is that if a consumer buys the 3D edition and was expecting to also have the 2D viewing option, they will have to mail in a check for $5.99 (plus whatever shipping and handling is involved in the process) to get that Blu-ray disc (how they store it once they get it is a matter of conjecture). When you have the gold you can do anything you please, but this smacks of a tin man’s ear when it comes to good PR and keeping your consumer base happy. We suspect that there will be few takers for this offer … and the push/pull for the 3D platform will prove to be disappointing for this ill-conceived marketing ploy. 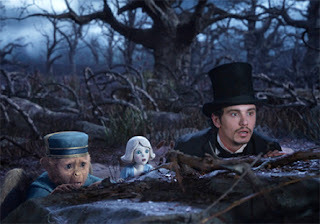 So there you have it, the curious case of Oz the Great and Powerful. As to the movie itself, there has to be one big sigh of relief (WHEW!) over at the mouse kingdom. When it comes to doing a remake, a rework or a re-imagining of a family (and cult) classic like The Wizard of Oz, you had better do it right and not in anyway mock or offend the fans (just ask Michael Jackson … oops, on second thought, can’t do that). Filmmaker Sam Rami sets just the right tone. Oz the Great and Powerful is the perfect companion piece … Bravo! There are also the aforementioned Blu-ray 3D SKU (with Digital Copy) — the SRP is $44.99 — but there are no bonus features listed (we believe that to possibly be an oversight, and that all of the aforementioned Blu-ray bonus features are include here … but then we could be wrong) and a Blu-ray/DVD Combo Pack (with Digital Copy) — the SRP is also $44.99. Four buying options in all, which seems like one too many, especially with the $5.99 add on deal. It makes for something of a marketing and PR mess … and it would seem that such a plan could only piss consumers off in the long run. 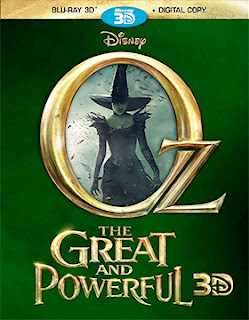 But then what do I know about anything to do with the marketing of an Oz film in the home entertainment arena!